Google Alerts is a great tool thats often overlooked and best of all it's free! One of it's more common uses is to set up alerts for your brand name and any keywords you are specifically targeting. Aside from these benefits, it can be used to monitor your competitor's brand. Set up is easy. All you have to do is sign into Google Alerts from your Google Account and set up as many alerts as you need. When you go to create an alert you will be presented with the following screen. Decide how often, how many results, what email you want the data to go to etc. 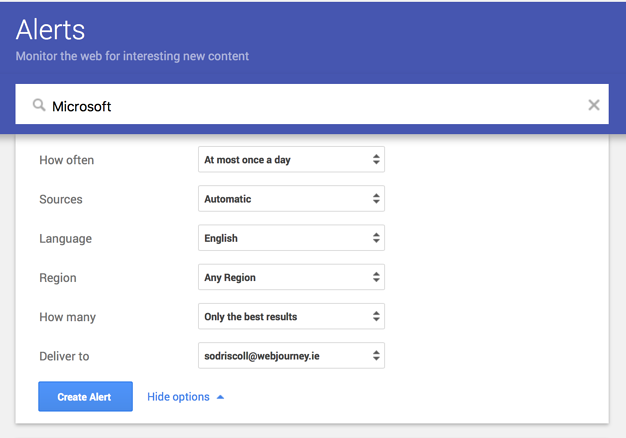 Note that Google Alerts can also be used for other marketing efforts like content curation, research, link building etc. So for a free tool it has many valuable uses. Have you ever used Google's advanced search feature? Did you even know it exists? If not, then you're missing out! You can do lots of things with Google Advanced search options. For detailed information check out this link. Put your competitors URL into a Google search using this syntax 'link:apple.com'. By doing this you can check out sites that link to your competitors and from there you can figure out if you should be trying to get links from these sites too. Link building should be a key part of your SEO strategy if you want to build your SEO and rank higher. But remember, the authority of the website providing the link is very important if you are going to benefit from the link. 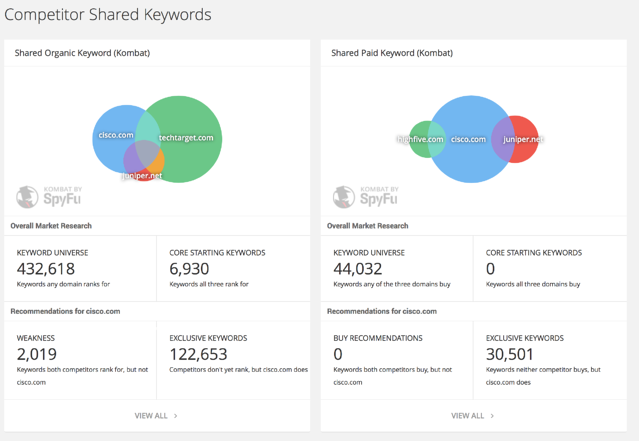 SpyFu has been around for many years and is one of the best SEO and PPC research tools available. You just plug in the URL of your competitor into the search box at the top and off you go! 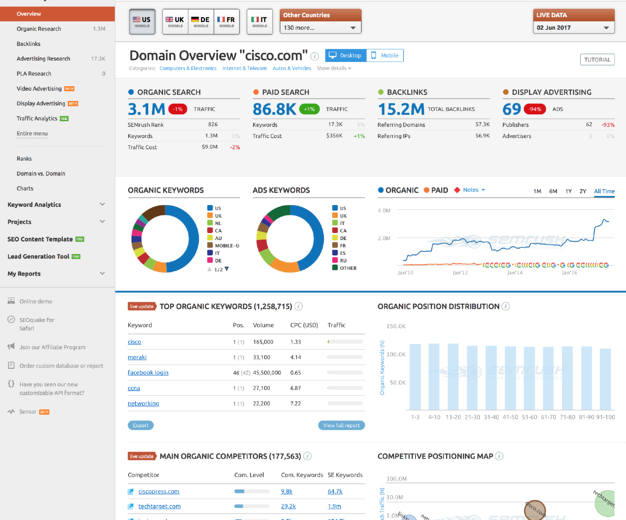 Use it to look at your competitors keywords - paid and organic. Use your competitors behaviors to fine tune your own digital strategies. Data is presented in a way that is easy to understand. For the novice it will show you what keywords you are lacking, advertising you need to be doing, along with things you are doing that are setting you apart from your competition and vice versa. Domain by Domain comparisons etc. There is limited functionality available free but you can try it out and get a feel for it before you purchase. The marketing grader is a holistic measure of a companies online presence and is reported on a scale of 0-100. Marketing Grade looks at a company’s overall marketing performance, including historical website grades, social media, lead generation, mobile, and other metrics. Rank as compared to millions of other sites on the Internet. For the HubSpot grader a lower rank is better. This data is collected from Alexa. The number of pages the website has had indexed by the most popular search engines. The number of domains currently linking to a site as recorded by Moz. Number of followers found for the Twitter account associated with their URL. The number of Facebook fans from the business page associated with their URL. A measure of link authority and popularity, on a scale of 1-10. Whether there is any known marketing tools being used on the site for marketing automation. This is a useful tool to do a high level review of your competitors and for tracking them over time. Do a quick check once a month to see how you compare. This includes overall visits, time on site, bounce rate's and page views per visit. 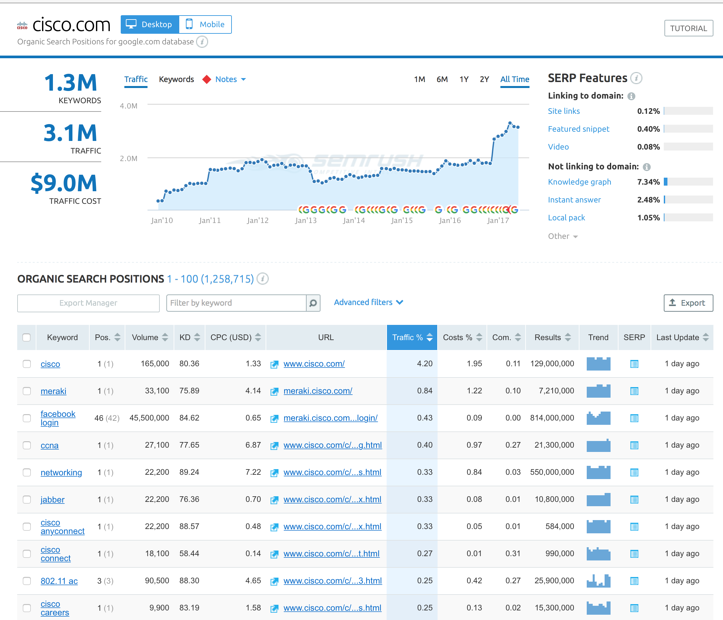 Use this to check out your competitors organic and paid keywords. it also includes ‘Google not-provided’ keywords. Look for keywords that are trending, how much traffic they generate and any paid ads linked to those keywords. Find which websites people are visiting at the same time as your competitors to uncover some really useful information. 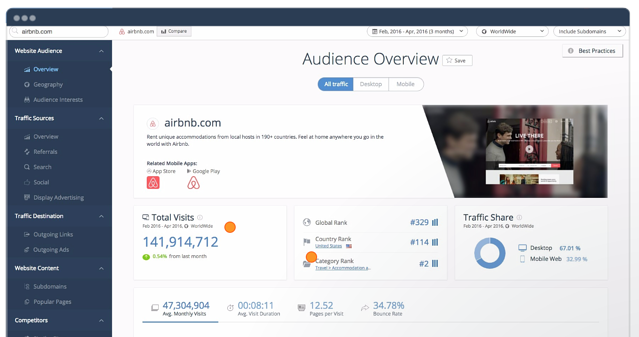 Uncover data for new audiences, potential re-targeting lists, affiliates and publishers. 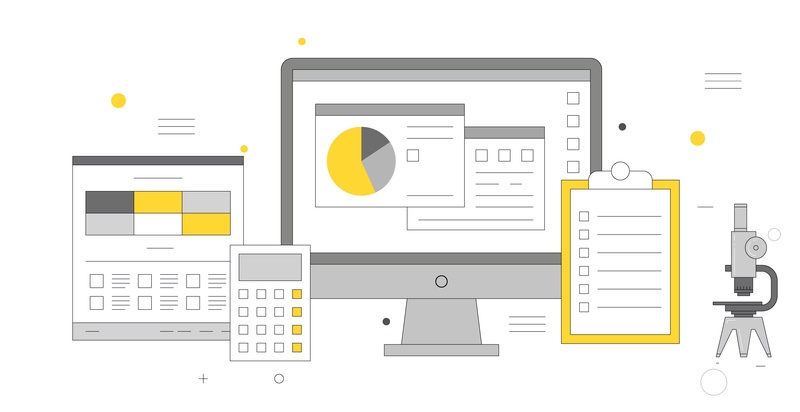 Find out about sources generating generate traffic to your competitor's website This data includes referrals, search, social and display sources. Expose your competitors acquisition strategy to find new and proven ways to grow your business. 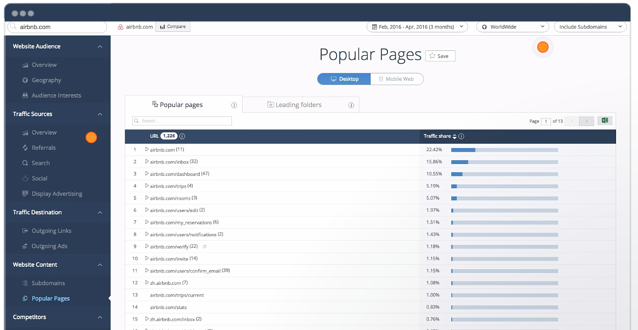 Reveal any website’s most visited and read pages. 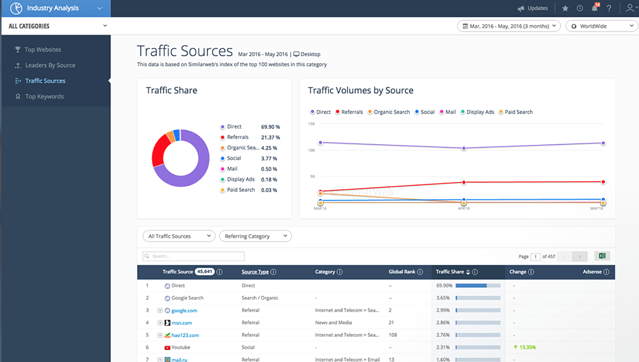 Use this data to track competitors’ campaign's and discover what content is generating the most traffic. Now SimilarWeb is a pricey tool but if you have the budget and think you'll get the return on it then it's a brilliant tool to have in your kit. Price: roughly $6,000 a year but you would need to get a more detailed quote for your business. This information is very valuable as you will see what's popular with their audience and you can look to include similar content in your own content strategy and schedule. 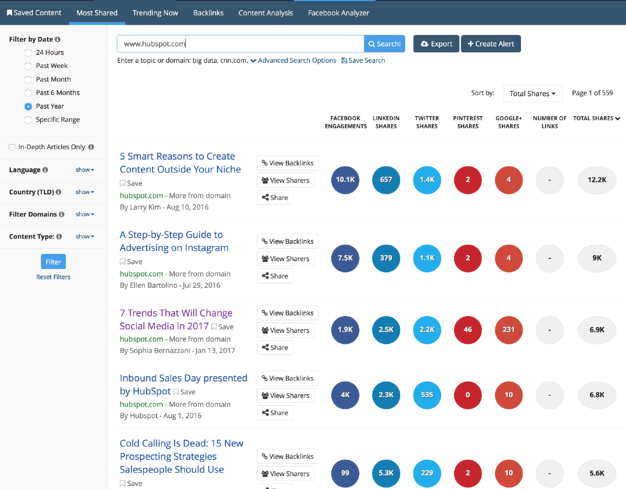 Another big benefit of Buzzsumo here is that you can actually see who is sharing their content. Now in the case of HubSpot's post it could take some to review the sharing information but it's likely that your competitors have a lot less content than HubSpot being shared on social media! Use this data to make lists of people who could be good influencers. Also use the Backlinks data for your own link building. See who has provided your competitors with inbound links to their site and check these out. Again authority is important if the backlinks are going to have a positive impact on your SEO. So these are just some of the multitude of tools available to analyse your competitors online marketing so that you can improve your own strategy and gain competitive advantage. 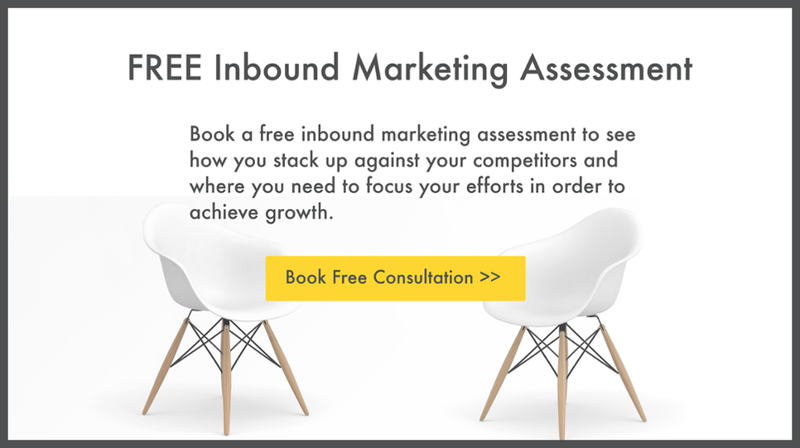 In the meantime, if you need any advice on completing a competitive analysis or choosing tools to help, please feel free to contact me at sinead@webjourney.ie or book a Free Inbound Marketing Assessment by clicking below where we can help you assess your current marketing efforts, challenges, gaps and make recommendations for improvements.